The last few weeks were a whirlwind. I left Neuilly-en-Donjon and drove north with Xavier; we passed through hundreds of miles of windmills and he dropped me off in the champagne region of France to catch a train to Paris. 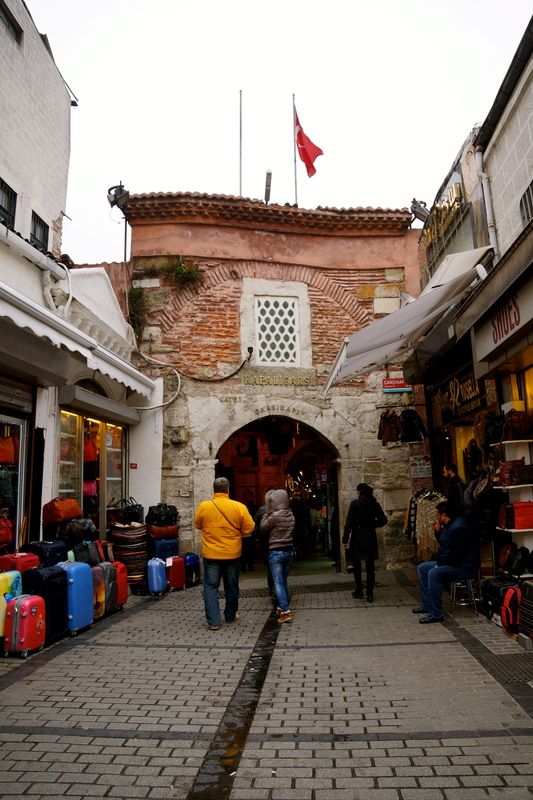 I took an early flight to Istanbul, Turkey the next morning and spent the week exploring with Miquela. 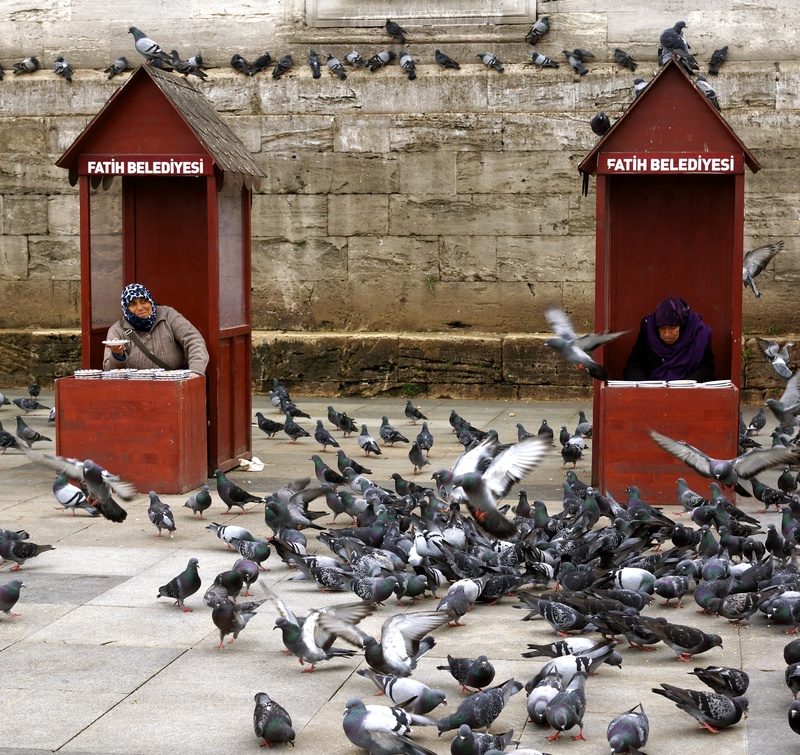 Istanbul is a magical city. 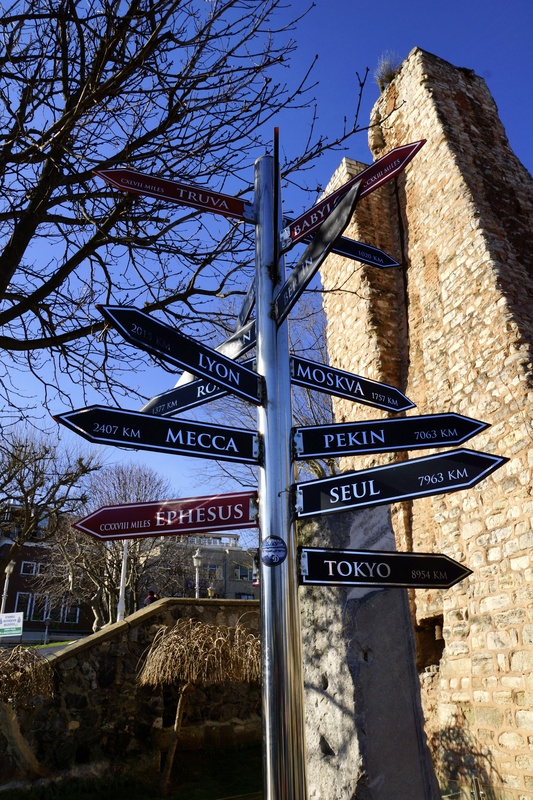 Geographically it is where Europe meets Asia, but as history shows it is also a major crossroads for politics, art, and religion. 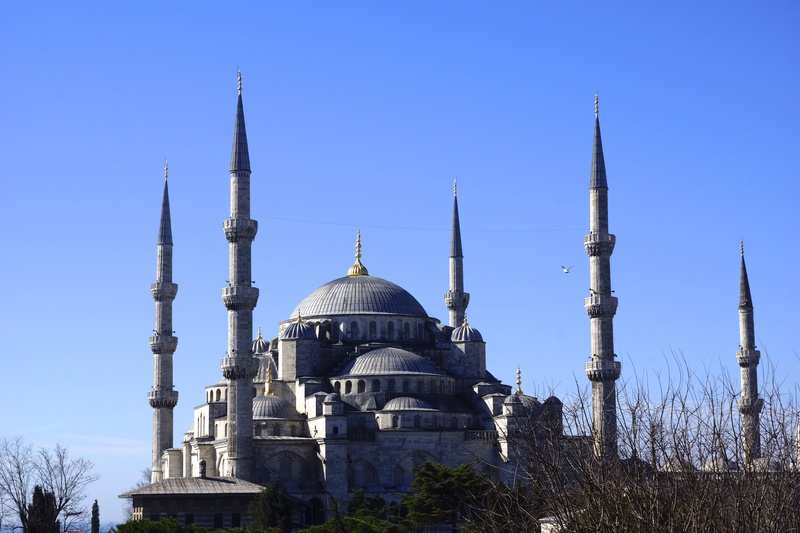 We started our day by making our way through Sultanahmet, the “old city,” of Istanbul, making our first stop at the Sultan Ahmed Mosque, also commonly referred to as the Blue Mosque because of the blue tile interior. It was built between 1609 and 1616 and although tourists regularly visit it, it is still used by practicing Muslims on a daily basis. 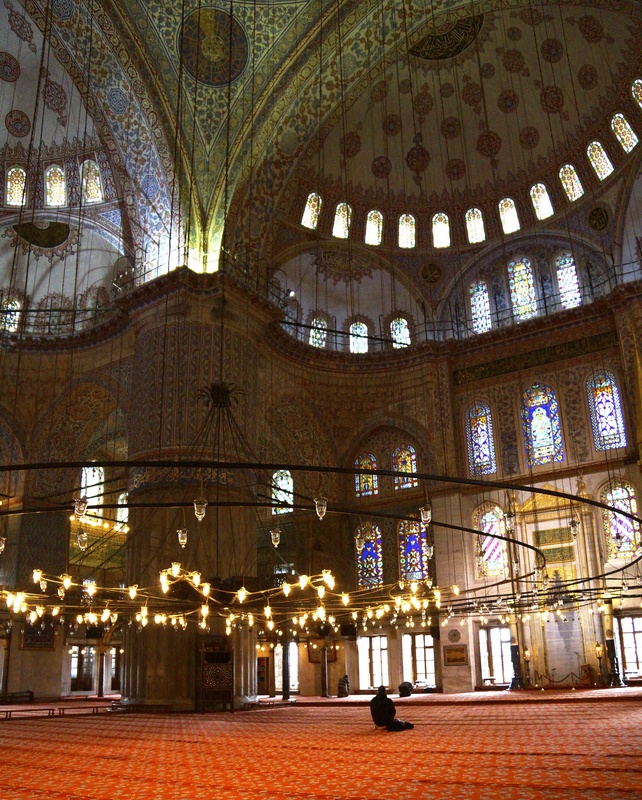 Upon entering, everyone is required to take off their shoes and women must cover their heads with a shawl; both men and women are required to cover their knees and are provided with a sarong or robe if they aren’t following the dress code. There are attendants at the entrance into the main area of the mosque to make sure you are dressed appropriately before walking through the doors. Passing through the doors was a jaw-dropping kind of moment. Everything grabbed my eye – first the crimson carpet, then the detailed tiles on the walls, and moments later the huge chandeliers hanging from the ceiling. When I travel to historic monuments, like the Blue Mosque, I find myself wishing I could capture all of the beauty in a photo, but at the mosque so much of the beauty came from the experience. 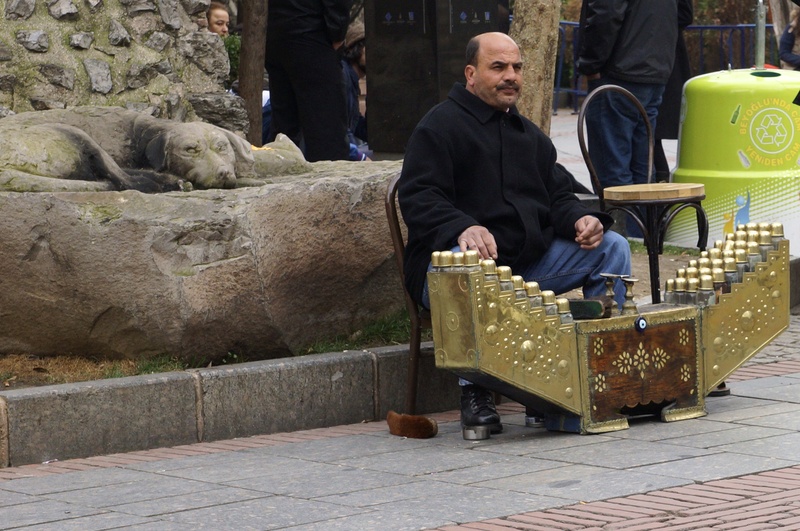 Listening to the music and prayer calls, heard in every corner of the city, was mysterious and intriguing. However, it wasn’t the elaborate decorations or the music that really shocked me – I was surprised that men and women are still required to pray in separate areas. I was told it is like for two reasons: to allow men to stay focused and to keep women from feeling as though they are being looked at. Even with an explanation, it doesn’t seem fair. Then again, I’m an outsider looking in. 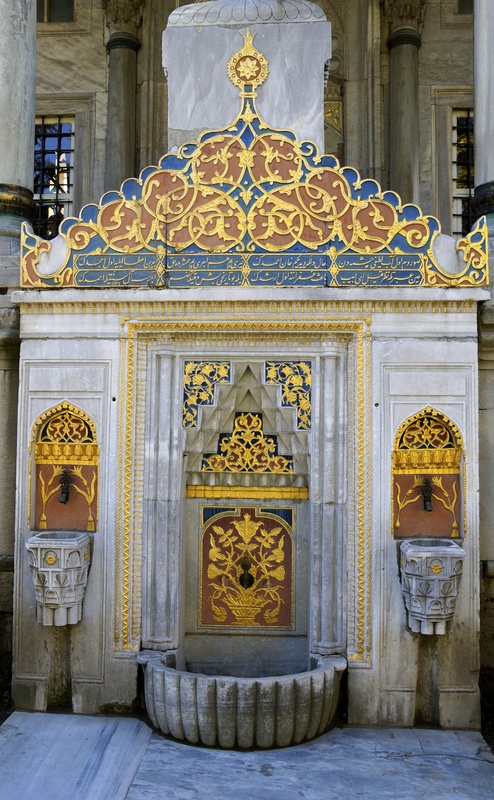 Men washing their feet outside of a mosque before entering. On a different note, most of you know my hair is quite blonde. Depending on where I am, it can also scream TOURIST. 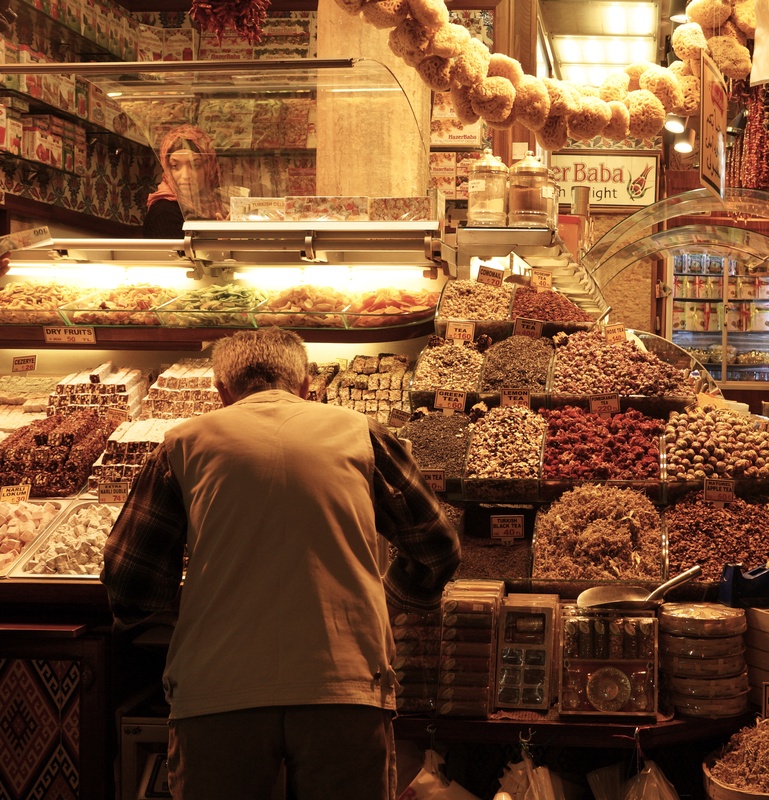 One of the places my blonde locks did that in Istanbul was at the Grand Bazaar, one of the largest and oldest covered markets in the world! 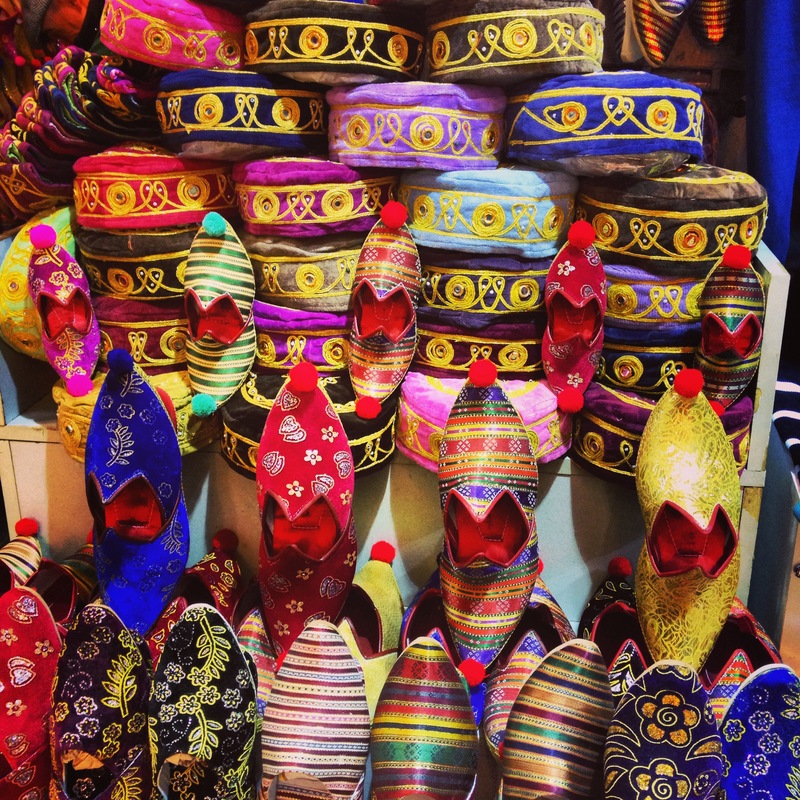 There were scarves, textiles, slippers, and more stacked six feet high, plates hanging on every wall, and spices galore. Miquela and I wandered through the market for a few hours during the afternoon (and got lost a time or two), we bought a few things, but not without a lot of bartering. You see, when you’re a tourist prices are usually doubled if not tripled. 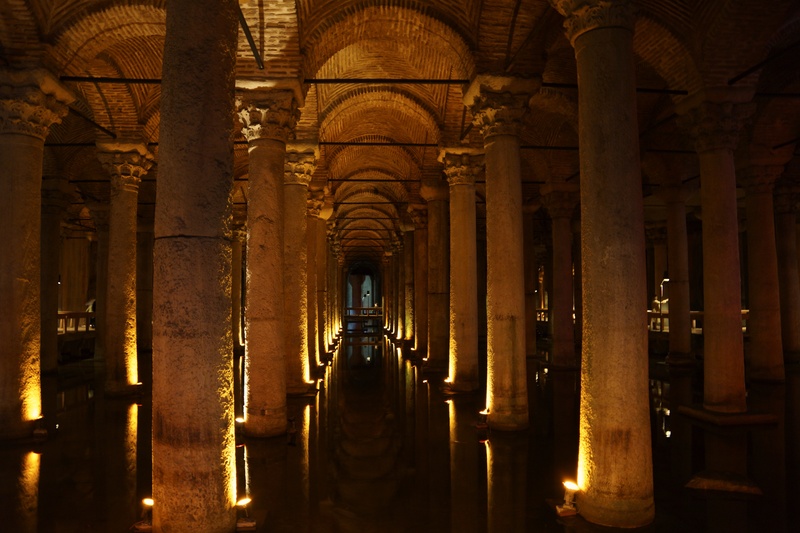 One of my highlights of the trip was taking 52 steps down into the underground Basilica Cistern. 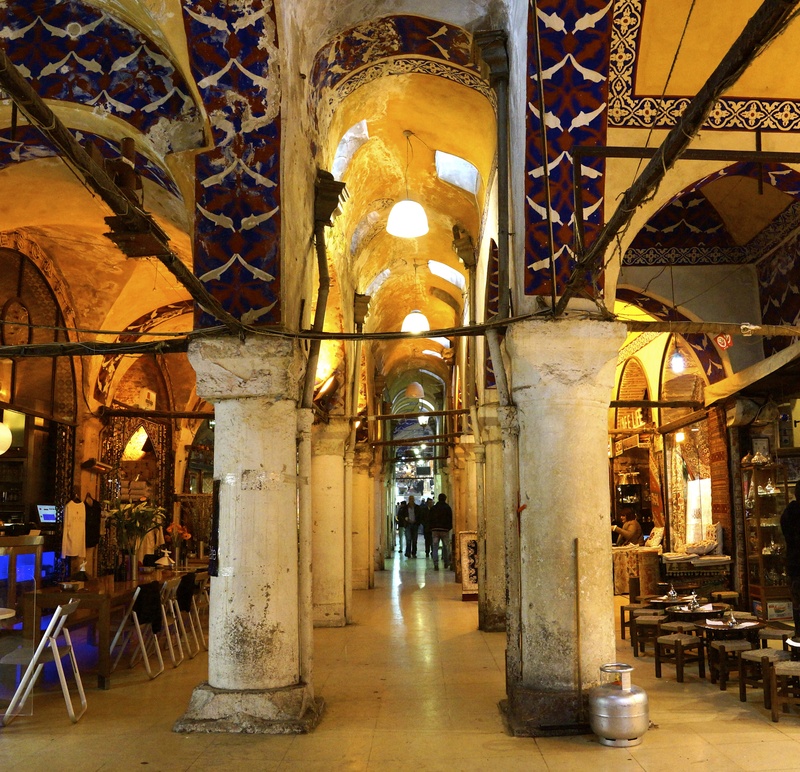 It was built during the 6th century and is one of a few ancient cisterns that has survived the test of time. It’s very quiet inside; as you stand on the walkways you can hear drops of water falling from the ceiling as they splash into the water filling the base of the cistern. "The Milion Monument was the starting point of the great Roman road Via Egnetia that lead to European cities and the reference point for measuring all distances on it." 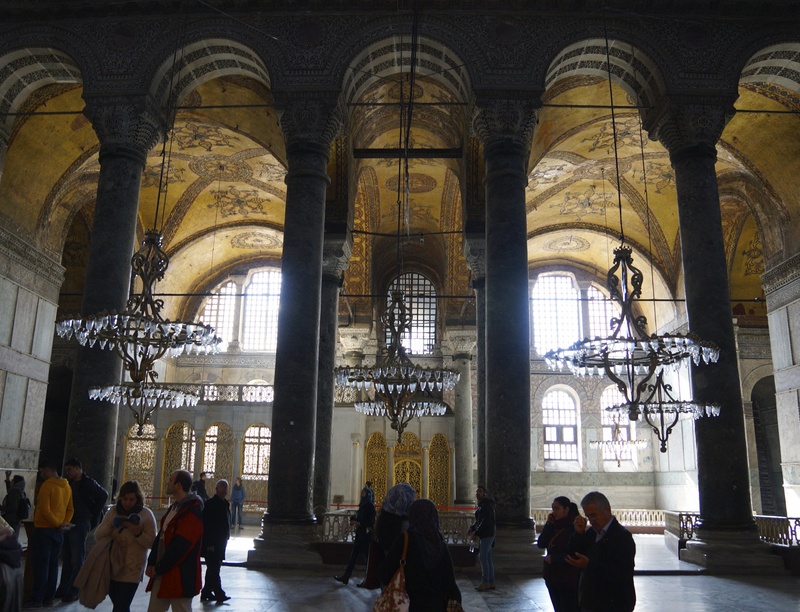 Hagia Sophia (Ayasofya) was unforgettable. As I made my way into the main area and looked up at the massive dome, I felt as small as an ant. 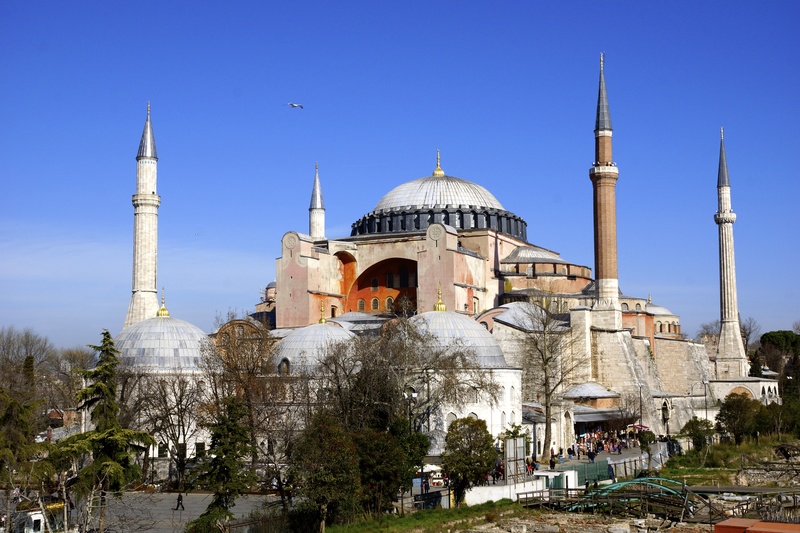 Under the rule of different empires it was a Greek Orthodox basilica, an imperial mosque, a Roman Catholic cathedral. 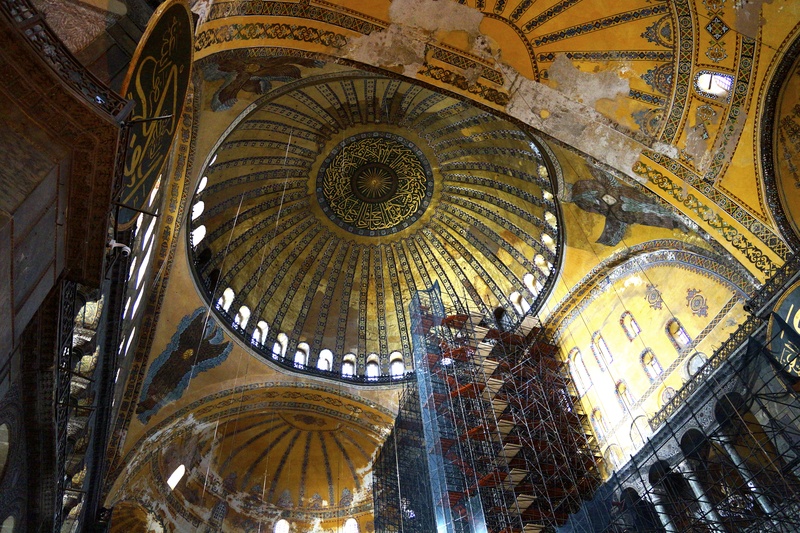 The different religious influences are very apparent inside; a mosaic of Mother Mary with baby Jesus, Arab calligraphy and byzantine mosaics are all there. 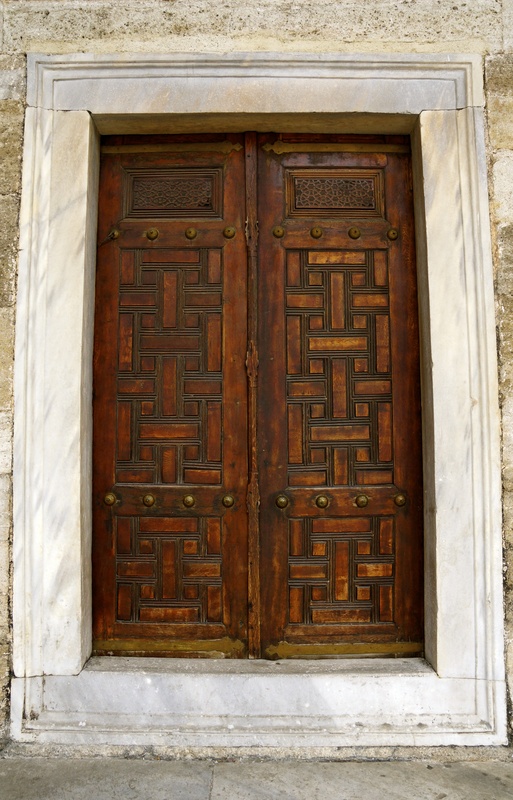 Even the doors, floors, and windows were beautiful. 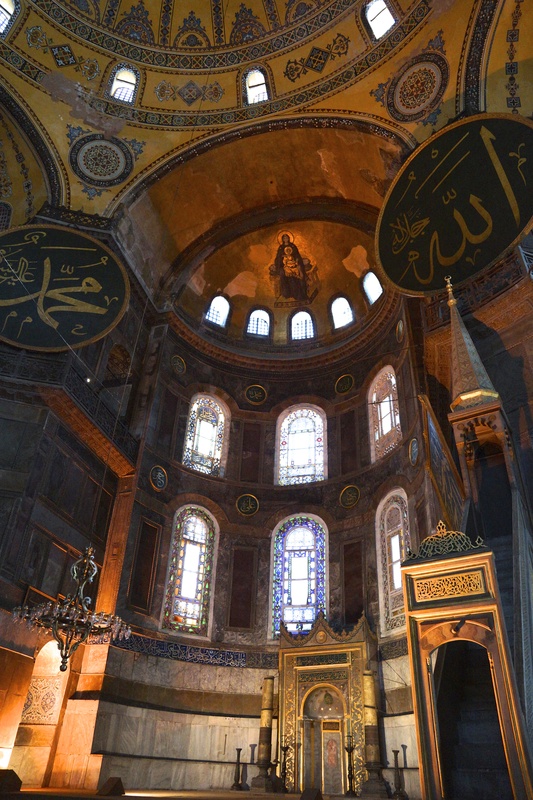 Each and every square inch of Hagia Sophia has a story to tell. 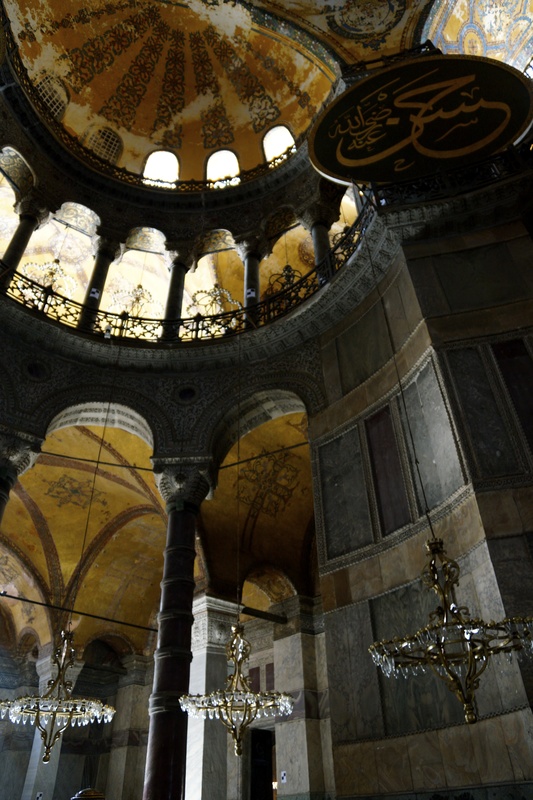 I was looking up at the dome again when I had a moment – I was standing in the middle of one of the world’s greatest architectural achievements, a place that was built nearly 1,500 years ago. 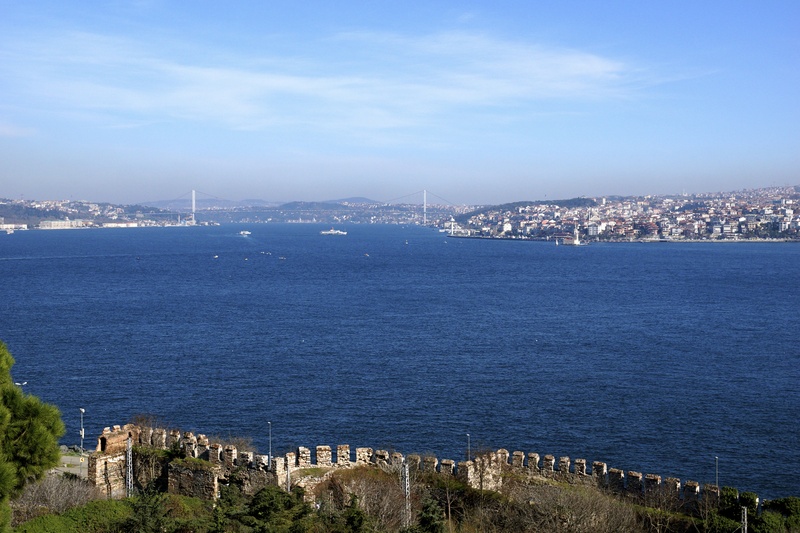 After spending a few days in the “Old City” it was time for us to venture across the Golden Horn via the Galata Bridge to the new district. 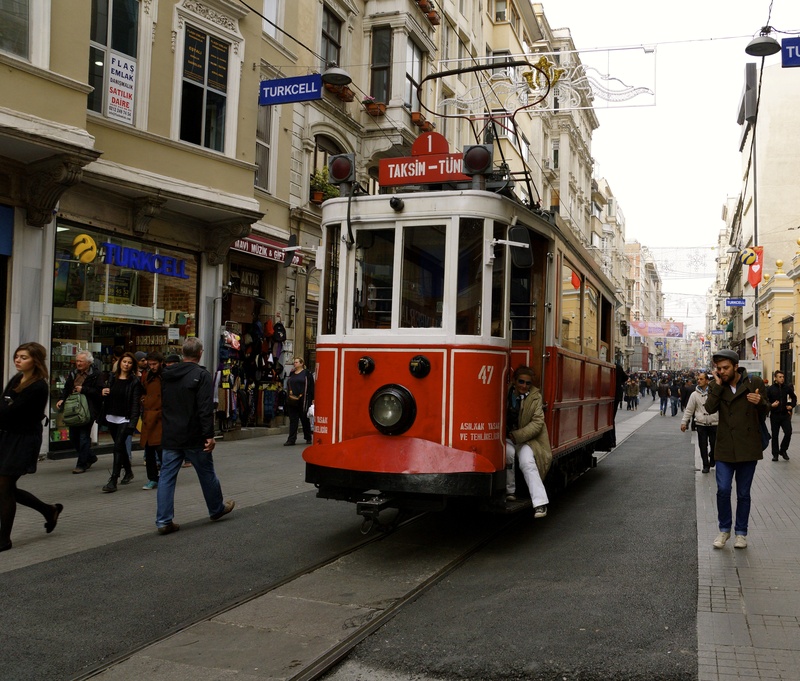 When you walk across the bridge and want to make your way to Taksim Square be prepared to walk uphill. 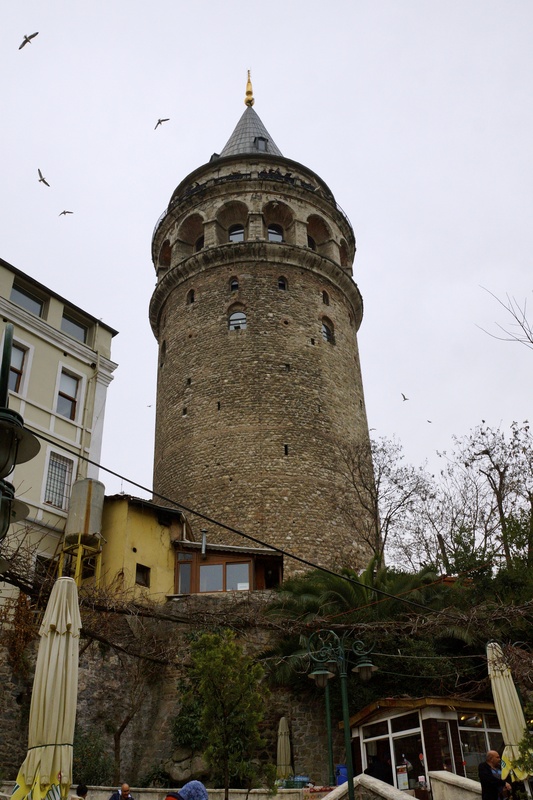 On the way up we wound up the narrow side roads, visited the Galata Tower – which has an incredible 360 degree view of Istanbul, stopped for a coffee and a few Turkish delights and visited a few boutiques. 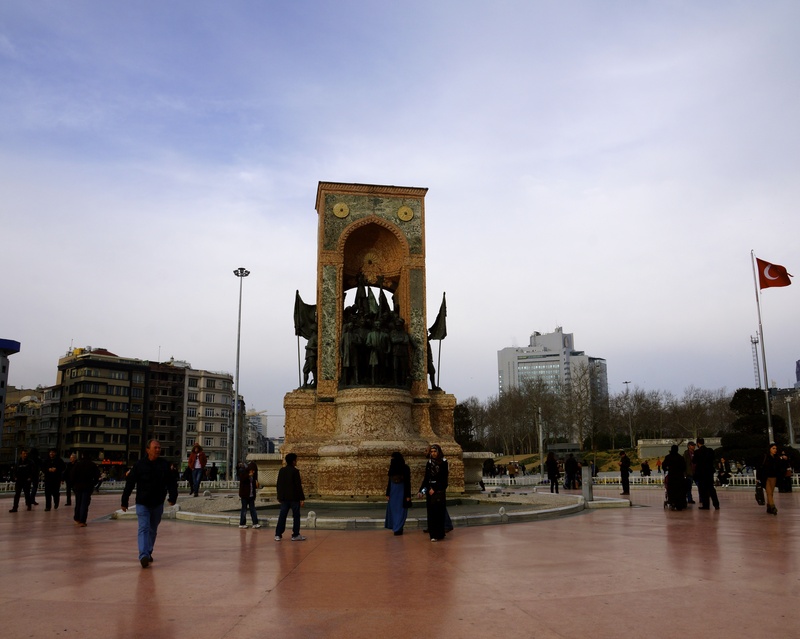 Taksim Square is not only a landmark of the past; it is also where the 2013 protests in Turkey began. 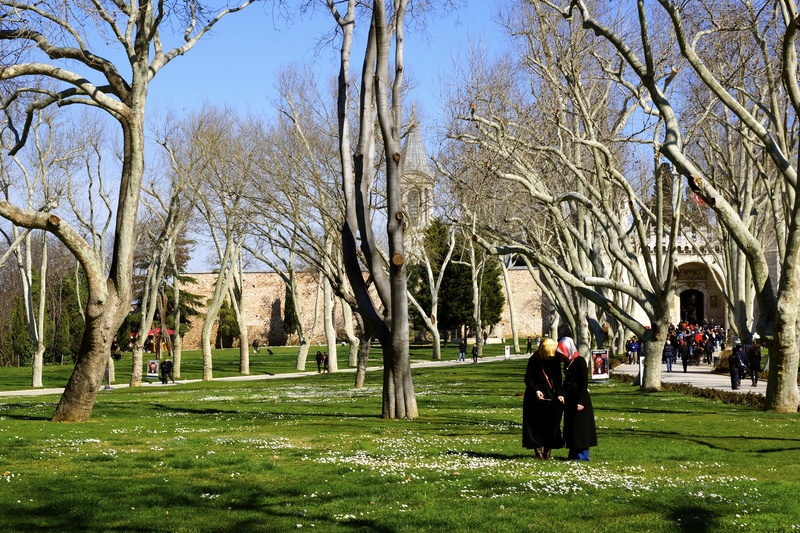 The protests began when people filled the Taksim Park to contest the development plan for the park, but it quickly turned political. Although the protests are not as massive as they were last spring, they are still happening on a regular basis. 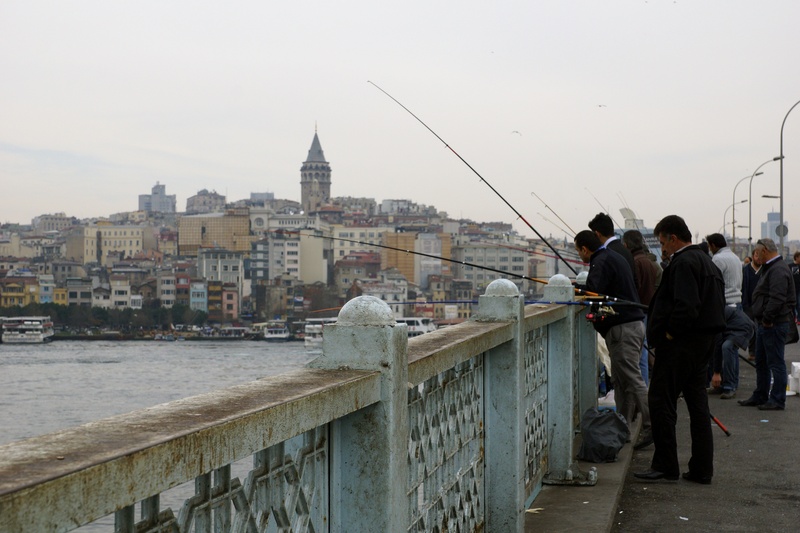 Fishermen on the Galata Bridge - if you're looking to buy fish the fresh catch is right here. 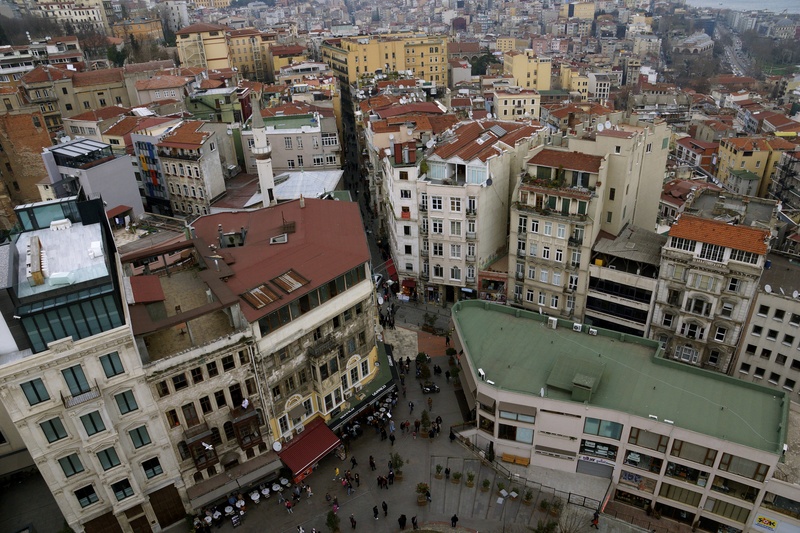 Galata Tower and view from above! From Taksim Square we walked back on İstiklâl Caddesi (Independence Avenue), an extremely busy pedestrian street. 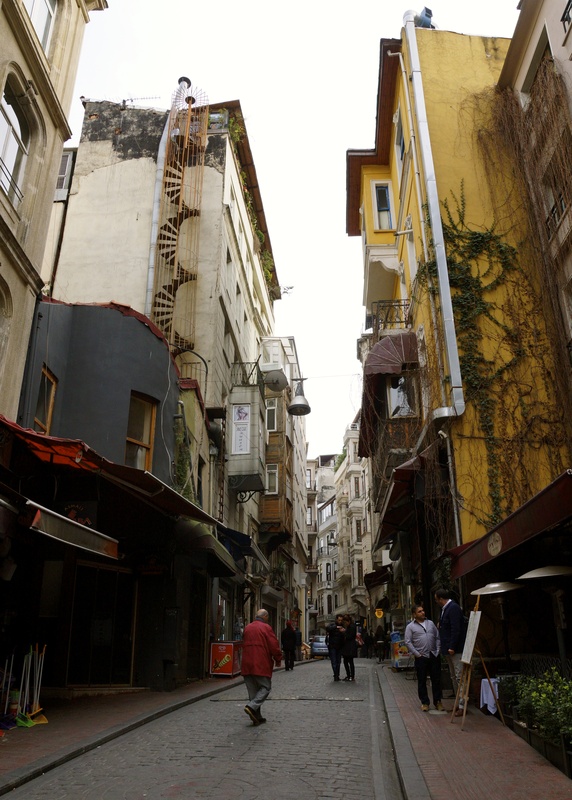 The street is lined with cafes, restaurants, and shops. There are little passageways that connect with the street that lead you in what seems like hundreds of different directions. 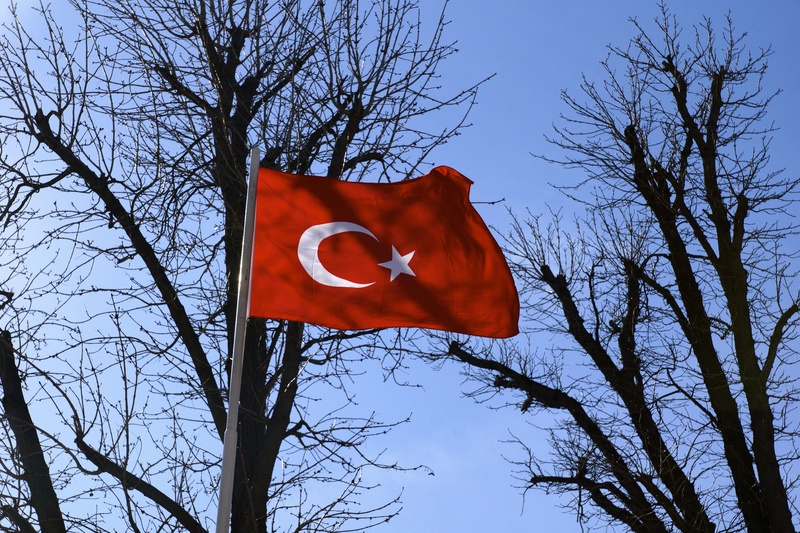 If you want to see nightlife in Istanbul, Taksim/Istikal is the place to go! I sailed on Semester at Sea with Asya, from Istanbul, so we were able to see the real deal when we went out with her and her friends. 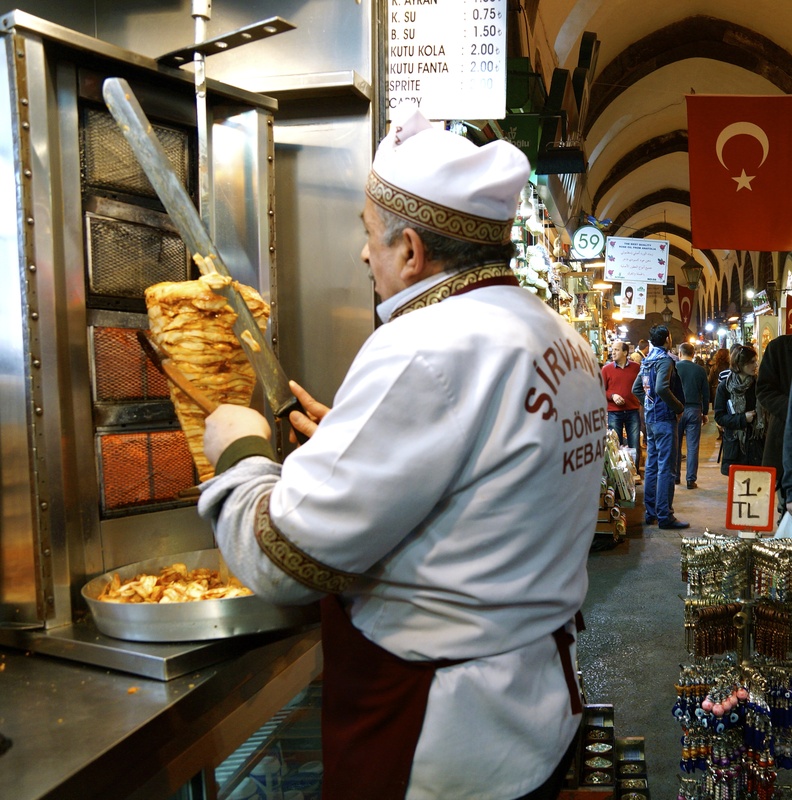 While in Istanbul, we were on “go-mode.” We made sure, or at least tried, to taste everything we could. 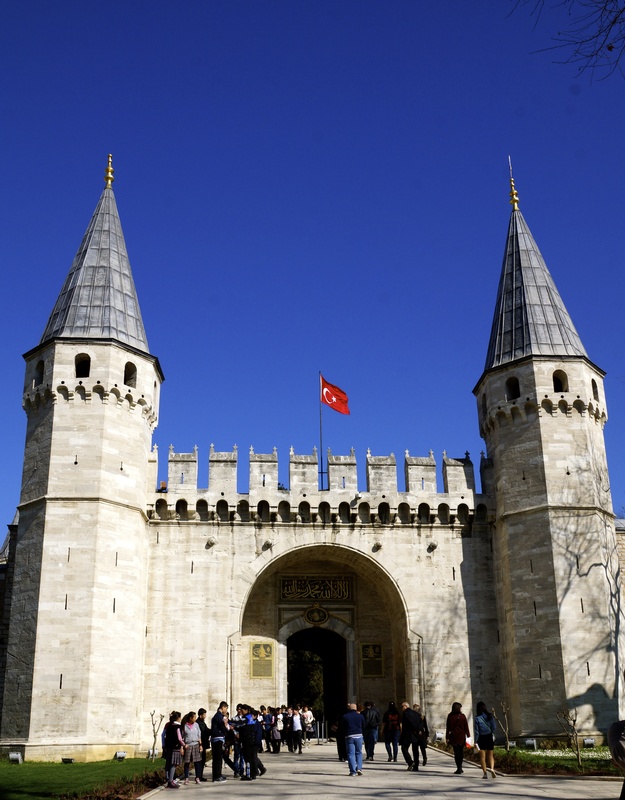 We spent hours in the Topkapı Palace, where the Ottoman Sultans spent about 400 of their 624-year reign, we walked along the Constantinople walls built by Constantine the Great, and we spent an evening at the Turkish baths – it was quite the experience. Often times I think we make the purpose of traveling reaching the destination. 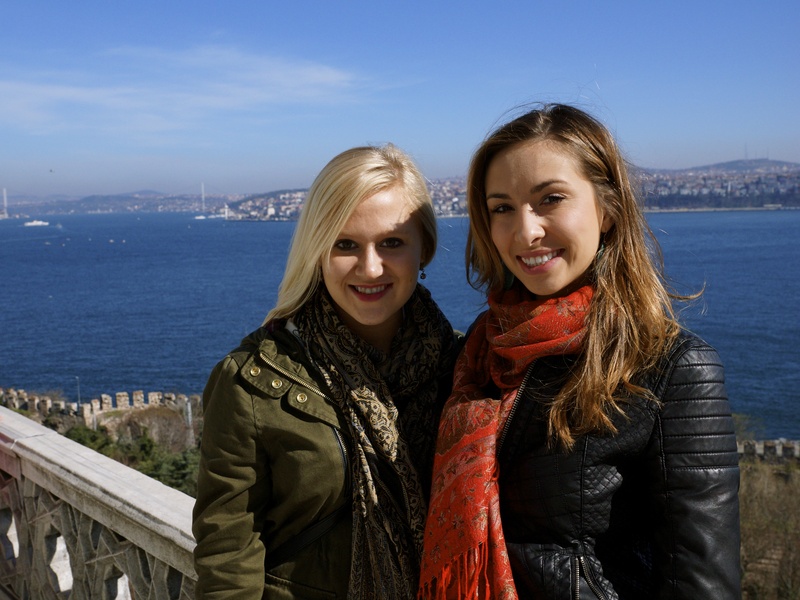 Some of my favorite memories of Istanbul aren’t the destinations themselves, but how we got there. 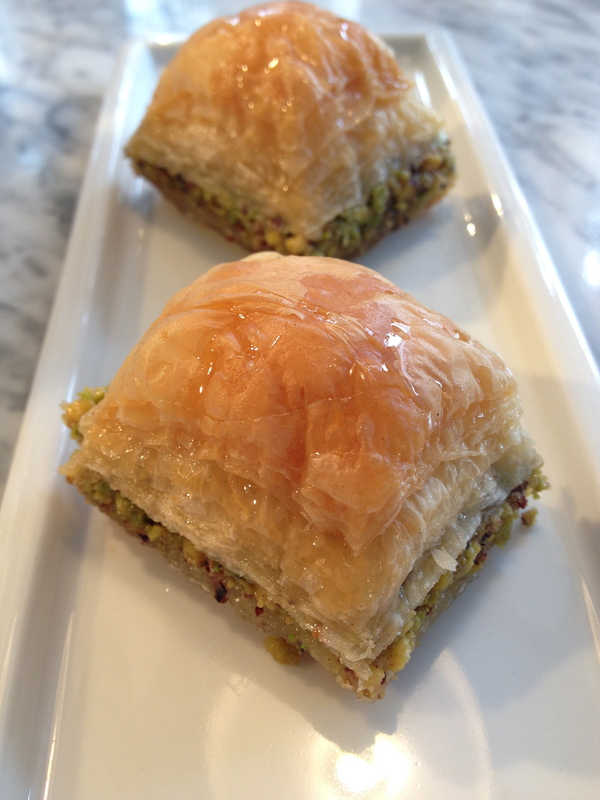 In Istanbul it’s important to stop for a cup of black tea with a friend. You don’t need to go anywhere fancy, the little tables and stools on the street are a nice place to watch everything happen. 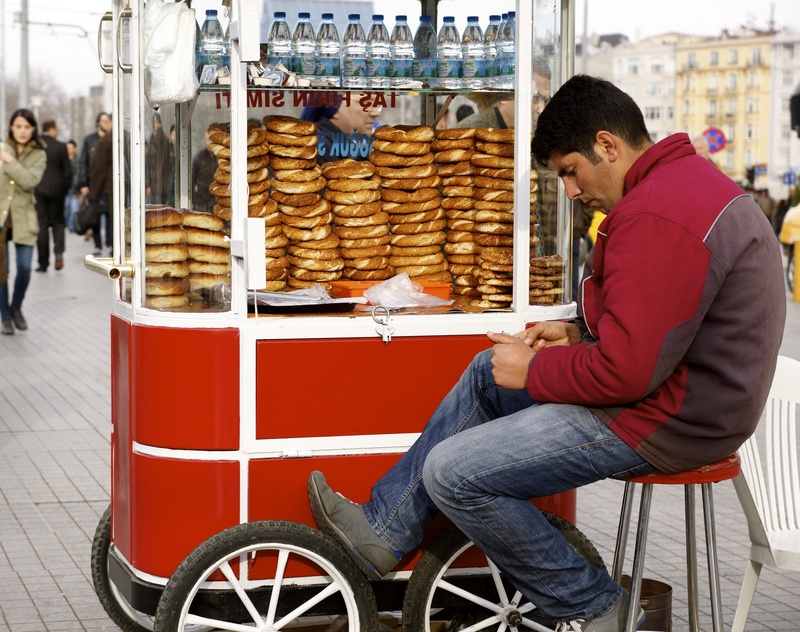 Taste simit (ring shaped bread covered in sesame seeds) and içli köfte (burghul and chopped meat). Walking down the street and looking at the beautiful carpets, paintings and plates with Mosques in the background, listening to prayer calls, and smelling doner kebabs cooking all at the same time doesn’t happen in any other city.